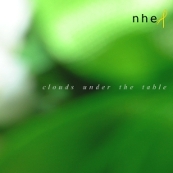 Nheap’s 2009 album ‘Skymotion’ was one of the highlights of the year and offered an Italian slant on the jazz/electronica/Post-rock scene. Massimo Discepoli is the man behind the moniker and ‘Clouds Under The Table’ will please those who enjoyed the last offering. The new album begins with a base of spiralling and hypnotic keyboard melodies, which form the foundation of ‘Gradient’. These are gradually augmented by sequences of different instruments. In that regard ‘5 March’ isn’t a whole lot different but the emphasis is more on the interaction between electronica and percussion this time. ‘The Snow That Never Falls Down’, however, takes the listener on a much more different route, here the tones are noticeably warmer and jazzier, calling to mind more famous contemporaries such as Tortoise and Jaga Jazzist. Thereafter, improvisation begins to dominate. ‘Daily Improvisation’ need no explanation but the title track in particular keeps the rhythms tight and the tunes fluid. Meanwhile, ‘Sands’ builds up an impressive head of steam as it reaches its conclusion. Although its title may promise otherwise, ‘Clouds Under The Table’ doesn’t quite reach the heights of ‘Skymotion’. Yet in here is an impressive consolidation of Discepoli’s distinctive sound.